Ranks are a visual way to show and compare players' experience, as opposed to just the total number of experience points they earned. 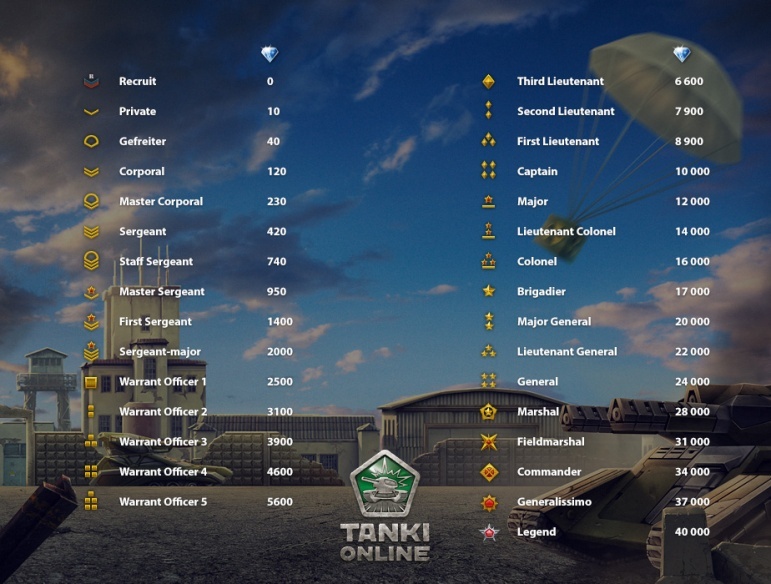 The titles and icons for the ranks in Tanki Online are based on real military ranks, with some creative input from the game designers. There are 31 distinct ranks in the game, from Recruit to Legend. The Legend rank is final, but once a player reaches 1 600 000 points and becomes Legend, after 200 000 more points they will become Legend 2, then Legend 3, and so on indefinitely. The Legend sub-divisions have the same icon and always 200 000 experience until the next Legend rank. Upon reaching a new rank, the player is rewarded with crystals, with the number of crystals increasing as the rank increases. See the chart in the image below to find out how many crystals are awarded for each rank. From all rank rewards combined, from Private to Legend, the player will earn a total of 354 010 crystals. After reaching the first Legend rank, the player will continue to get 40 000 crystals for every new Legend rank obtained. Experience Points (aka. 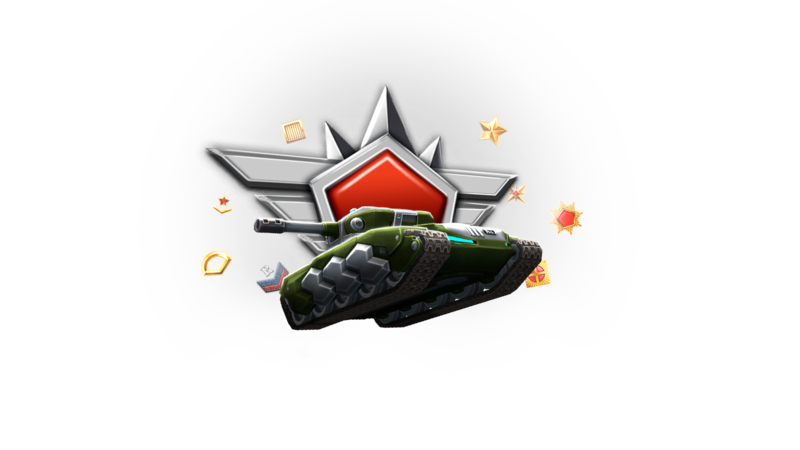 EXP), are one of the single most important features in Tanki Online. Experience allows you to rank up, which can give you access to play in new maps, unlock new equipment, unlock higher modifications, play in battles with higher ranked players, gain access to different Forum Groups, etc. On the leftmost, your rank is displayed. On the actual EXP bar, the first value shows how much total EXP you have earned and the second - amount of total experience you need to have to get the next rank. Then, your exact rank is written in words, followed by your username, including the clan tag if you are in a clan. On the rightmost, your Efficiency/Effectiveness Rating is shown. This figure is calculated using a complicated formula which reflects how effective you are in battles. The value of your own rating is displayed on the right hand side of the EXP bar and is preceded by an "R:" (which stands for Rating). There is a separate page which shows the Top 100 players efficiency-wise. This ranking is gradual and is not reset weekly. Please note that the complex formula used to calculate the efficiency/effectiveness of a tanker has not been disclosed by Developers. a player receives a share of 15 EXP per kill in team battles; 10 EXP per kill in DM. In TDM, CTF and CP battles, when an enemy tank is destroyed by several allies then all of them receive 15 EXP in total. It does not matter who finally ended up killing the enemy as the score is divided between allies according to how much damage each tanker dealt. The points you receive for all of the above can be further increased by buying (or obtaining) a Premium Account or being in possession of a "Beginner's Pass". Both, Premium Account and the Beginner’s Pass gives you an additional 50% EXP. However, this additional EXP does not give you an in-game advantage - the bonus EXP goes towards your total EXP and does not count in-battle. Note: Experience points earned in team battles [e.g. capturing the flag (excluding kills and such)] depend on the number of players present in the battle - meaning that if you capture the flag in a 15 vs. 15 battle for example, you'll get way more experience points than if you would capture the flag in a 1 vs. 1 battle. On the 3rd of February, 2011, a notification system informing players that they had ranked up was implemented. Additionally, the pop-up panel showing players what equipment was available for purchase at their new rank was implemented. Up until the 17th of December, 2012, the highest rank achievable in the Game was Marshal. The first person to reach this prestigious rank was a tanker named T7000, in the year of 2009. 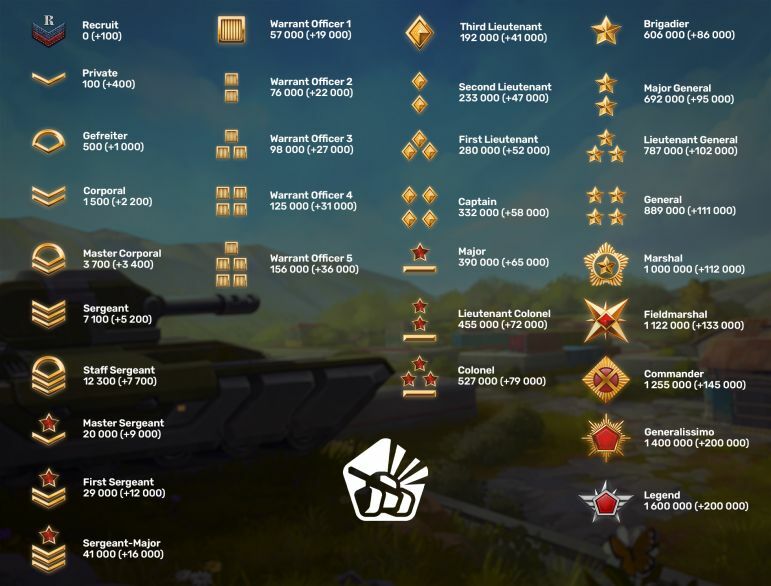 On the 17th of December, 2012, the ranks Fieldmarshal, Commander and Generalissimo were added to the Game. On December the 19th, 2013, (Patch Update #208) the visual effect when a player ranked up was implemented, together with crystal rewards for ranking up (statistics for these can be found above). On June the 3rd, 2014, (Patch Update #264) the Chat became available to ranks with Gefreiter or higher. On December the 27th, 2014, (Patch Update #302) a system was introduced where players were automatically redirected to the server most appropriate for their rank upon entering the Game. This feature is no longer applicable as a result of the Server Unification update in 2017. On the 11th of November, 2016, the brand new Legend rank was introduced to the Game. It became the 31st and final obtainable rank. More details about the Legend rank can be found in its respective Page. Additionally, minor updates affecting ranks, such as Rank limits frequently happen due to changes in Game Balance. This page was last modified on 31 August 2018, at 22:14. This page has been accessed 1,106,338 times.